PT Brantas Abipraya (Persero) - PTBA or known as "Brantas Abipraya" is a national scale general construction firm, domiciled in Jakarta. 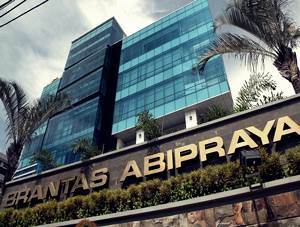 PT Brantas Abipraya (Persero) has main responsible for providing general construction services. PT Brantas Abipraya (Persero) has main business competencies on construction projects related to water infrastructure. Its projects include dams and weir, tunnel work, road and bridges, irrigation and river improvement, dredging and reclamation, and manufacturing landscape. PT Brantas Abipraya (Persero) is a state-owned company and is fully-owned by the Government of Indonesia. As of December 2017, PT Brantas Abipraya (Persero) has 3 division offices, 4 regional division offices, 4 branch offices, and 3 precast factories spread in all over Indonesia. Brantas Abipraya was formed by the Government of Indonesia in 1980 as an expansion result of Brantas river Project Development, the development project of Brantas river basin in the East Java province. In the business year of 2017, PT Brantas Abipraya (Persero) keeps growing with sustainable performance. According to information found in PT Brantas Abipraya (Persero) Annual Report 2017 as cited by JobsCDC.com, PT Brantas Abipraya (Persero) registered total assets of Rp 4.31 trillion in 2017. This number is 45% higher than total assets in 2016 amounted to Rp 2.97 trillion. PT Brantas Abipraya (Persero) has succeeded in booking total revenue of Rp3.89 trillion or up 17% from Rp3.32 trillion in 2016. Referring to its annual report, total net profit in 2017 amounted to Rp 271.27 billion. This reflected an 52% increase from Rp 178.25 billion in 2016. Male with the maximum age of 26 years old prior to the date of 31 August 2018. Minimum Bachelor of Engineering (minimum GPA: 2.75) with concentration in Civil Engineering, Irrigation Civil Engineering, Architectural Engineering, Electrical Engineering (Power Lines), and Mechanical Engineering. Minimum Bachelor of Economics (minimum GPA : 3.00) with concentration in Accounting and Financial Management. Minimum height of 165 cm with ideal body weight. Willing to be placed in all working areas of Brantas Abipraya throughout Indonesia. JobsCDC.com now available on android device. Download now on Google Play here. Please be aware of recruitment fraud. The entire stage of this selection process is free of charge. PT Brantas Abipraya (Persero) - Management Trainee Brantas Abipraya September 2018 will never ask for fees or upfront payments for any purposes during the recruitment process such as transportation and accommodation.